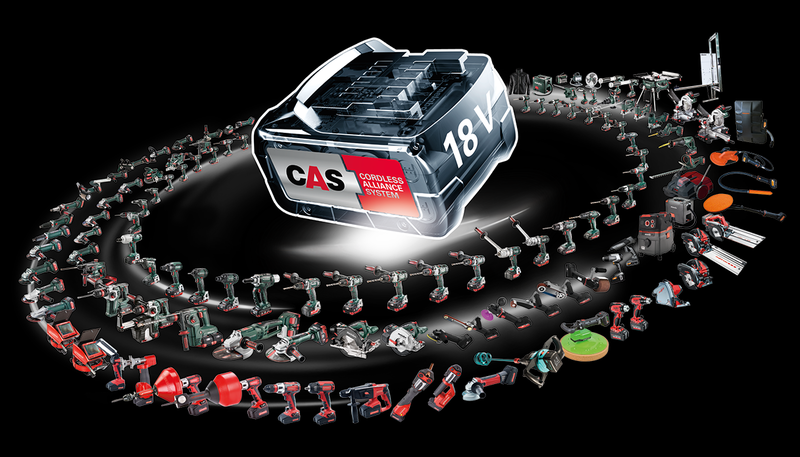 Cordless Alliance System (CAS) is a cross-manufacturer battery pack system of leading power tool brands. This permits now a number of professional applications also with battery packs - from standard to special tasks. 100% compatibility for over 120 machines in the 18 V class! 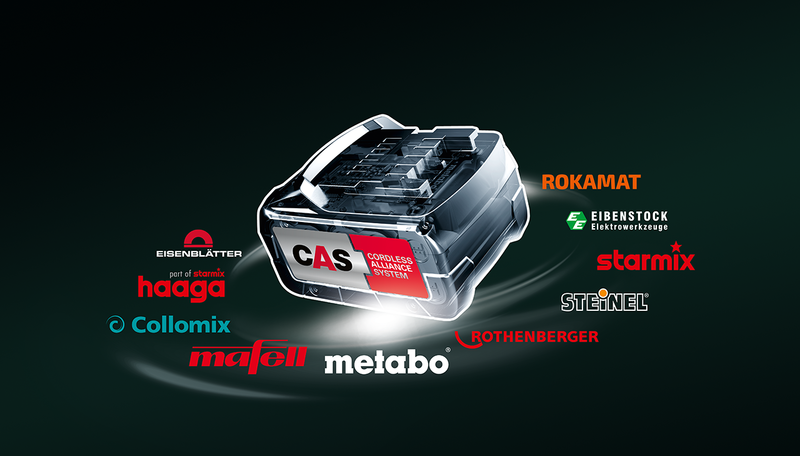 Unlimited combinations: Now you can combine machines, battery packs and chargers of different manufacturer with each other without any problems..
CAS uses the world's most powerful battery pack system in the industry - from Metabo. 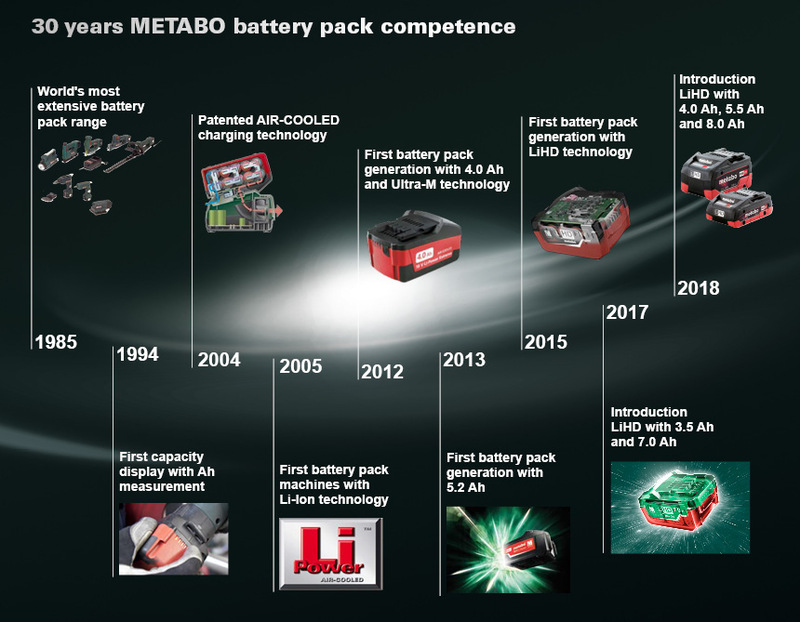 With more than 30 years of battery pack expertise, Metabo is pioneer in the battery pack technology and in the topic of "cordless construction site". Since 2009 battery packs of any generation are 100% compatible with each other - with all machines and chargers of their volt clas. This is true today and will be true also tomorrow. CAS stands for a sophisticated battery pack system on which you can now also rely for different standard and special applications. How do you benefit from it? Thanks to the multiple use of existing battery packs you achieve clear cost benefits. CAS also offers highest reliability and high investment security of a guaranteed sustainable battery pack system. 100% reliable manufacturers! 100% security for you! The CAS partner are an alliance of generalists and specialist with clear focus on power tools for professional applications. The alliance unites innovative power, high performance of the products and the common goal to make professionals independent from the power socket. Further information on machines, battery packs and chargers as well as services of the relative manufacturers can be found by clicking on the respective "to website" link. Manufacturers of power tools for professional users in the area of building trade and renovation as well as metal trade and industry. With the LiHD technology, Metabo is leading provider in the cordless segment. Power tool specialist for carpenters, woodworkers and neighbouring industries such as drywall construction and plasterers. From development, production to installation – MAFELL is: Made in Germany. Leading manufacturer of pipe tools and machines for fitters, heater contractors, refrigeration and air conditioning technicians and service fitters. The expert in mixing devices all around construction and facade with a variety of hand stirrers and special stirrers. Manufacturer of innovative and high-quality power tools for use on construction sites and in industry. More than 90% are made in own production with the seal of quality “Made in Germany”. Specialist for cutting and grinding accessories and machines, e.g. for the metal trade, steel and plant engineering as well as for shipyards. Eisenblätter is known especially for the development of it angle grinders, longitudinal grinders and belt sanders. Specialist for handheld sweepers and inventor of the rotating circular brushes. Manufacturers of vacuum cleaners for cleaning applications for industry, trade and hotel industry, as well as of hair and hand dryers for sanitary facilities. Manufacturer of hot-air blowers and hot-glue guns for trade and industry. Special solutions for construction industry. Innovative machine technology for insulation (EIFS and ETICS), drywall construction, renovation, concrete and plaster finishing.